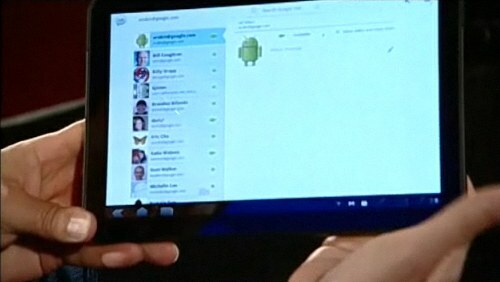 Andy Rubin is, as I type this, in the middle of a demo of Android 3.0 (AKA Honeycomb) at Dive Into Mobile. The rest of his talk I’ve got written up elsewhere, but this was too cool to pass up. The software is running on a prototype MOTOPAD that looks really slick, though it was only out for a moment and there are but few pictures at the moment. I’ll be updating this post as more information breaks. 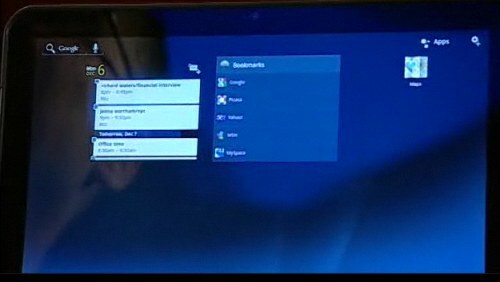 First thing he showed off was a new lock screen and then what appeared to be a brand new “desktop” with widgets and buttons in the corners. Different UI aesthetic than earlier versions of Android. He then launched the new, 3D-and-vector-based version of Google Maps that should be coming to your phone in just a couple days. Honeycomb will be out “next year,” which is a pretty vague deadline, but if I remember correctly, we’ve heard Q2 for the Moto tablet. Another improvement he notes is the ability to split applications into multiple “fragments,” i.e. 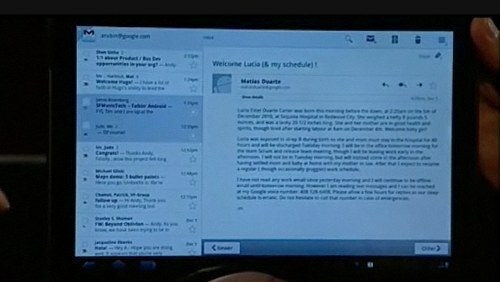 a mail app would have two panes for mail and inbox, which would be viewed sequentially on a phone but simultaneously on a tablet. There’s a new app grid and Gmail appears to have gotten a much nicer version of itself, which I would bet money is a lot like what they’re going to show off tomorrow at their Chrome thing. 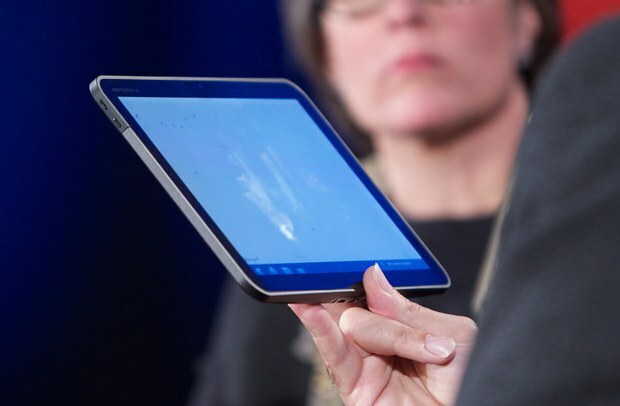 The tablet itself looks to me to be larger than the 7″ we heard a while back, but it’s really difficult to tell without actually being there. I’d guess 9″ at 16:10 from these pictures. I don’t know how big Andy Rubin actually is, so my frame of reference is a bit off. I’ve always said the Android versions we’ve had are a bad fit for tablets. This looks like a different story. I’m looking forward to Honeycomb.